The Classic Battledome was an important part of Neopia for a very long time, and held a special place in the hearts of many. Despite being essentially untouched, mechanics-wise, since its inception, the Classic Battledome grew into an important part of Neopia. It was a cornerstone in numerous plots, and spurred a huge following in the form of guilds on the Neoboards. By the time it said its final goodbye, however, the Battledome had lain dormant for quite some time. In this article we pay tribute to the Classic Battledome, and all the fun (and annoyances) it has given us over the years. Opening the Battledome for the first time may have seemed daunting for some - the wall of text and outdated art proved rather jarring if you didn't know what you were doing. This opening page was home to the Arenas, an unused feature which allowed Neopets to place the Battledome in places all over Neopia in plain sight. From this hub, users were able to select between one- or two-player challengers, look up basic information on weapons and abilities, or read rules and information. This system of navigation changed little over the years, but the text would often reflect recent events in Neopia. 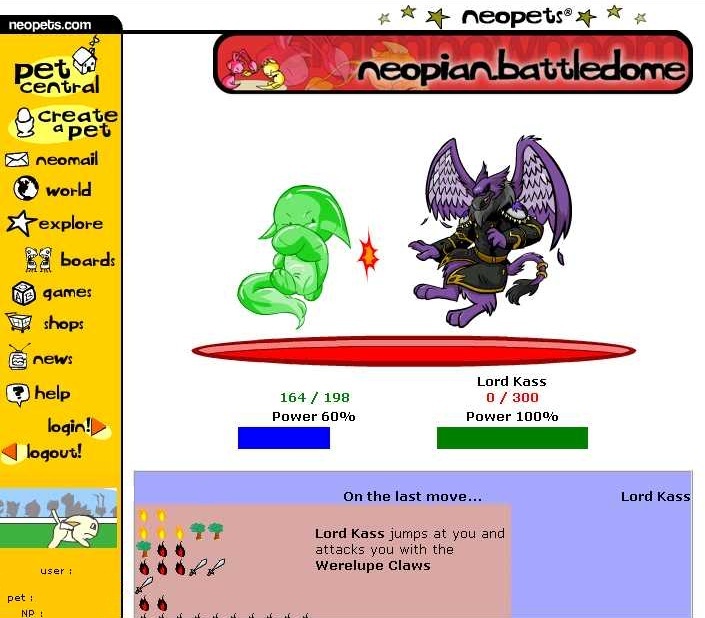 When actually fighting in the Classic Battledome, your pet would be on the left hand side, with the opponent (be they one-player challengers or another Neopet) on the right. A clear display showing HP, Power, and Icons during each attack made the Classic Battledome very clear. Animations would sometimes show up between competitors (depending on moves and weapons used) to add more "action" to the fight. The ability to communicate - via taunts and other means - allowed the Battledome to feel a little more lively. 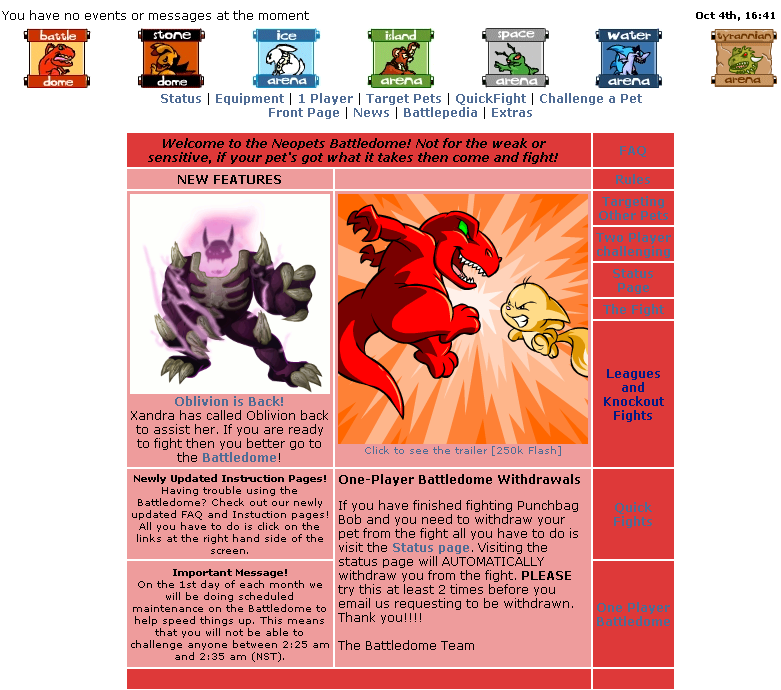 The Battledome had been promised soon after Neopets launched, and many players hoped that one day they could battle between themselves and prove their pet's superiority. Neopets had originally been started for bored college students, so the promise of fighting the pets was very alluring to the playerbase. In February 2000 the first step was taken, with the creation of the ability to equip pets with items. Time passed, and progress on the Battledome proceeded apace. During October 2000, a new plot launched, which would become the starting point for the Battledome. In addition to bringing the Battledome into Neopia, this plot also introduced both Maraqua and Kitchen Quests. Although at this point users could not fight in the dome, they were now able to collect one-player challengers for when it opened. During November and December of 2000, the Battledome was finally introduced to the general Neopian public. Alpha tests began for 2P challengers, and with them came users' first taste of the Battledome. Many significant updates were made during this time, and important Battledome-related parts of the website were introduced, including Neggs, the Lab Ray, Guilds, and the finalization of Faerie Abilities. The dawning of the new year brought with it many Battledome developments, and 2001 ended up being the first year that the Battledome was truly open to the public. January saw the wins and losses table being completed, Arenas being opened, and the beginning of the slow (almost crawling) release of pet abilities. More importantly, however, this was also the month that the open beta began, and all Neopians were able to experience the Battledome. By March the Battledome was finally ready for its official opening, and with it came the quick-fight option. In April TNT implemented a feature that would disappear years later without warning. 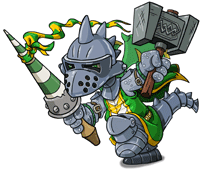 On occasion, petpets began to appear to help their owners in the Battledome based on their rarity. Foundations of this system are still in place in the form of the Petpet Battledome in Darigan Citadel, which promises to make them stronger in fights. Later in April, alpha testing for the one player Battledome finally began, allowing users to make use of their 1P competitors and laying the foundation for war. With the building blocks of the dome fully in place, and everything finally up and (mostly) working, the War for Tyrannia started in a blaze of glory. This was the first war, and while it was not a two-player war, it did allow users to team up and fight for victory. Ranks and points in the war would even show up on one's userlookup, alongside hobbies and the like. The war lasted for a few weeks before the boss of the war, the Monoceraptor, arrived and was defeated by dedicated Tyrannians. Prizes were released; however, unlike future events' exclusive prize items, the Tyrannian War only gave out 10k NP and a trophy to participants. One lucky person, however, got 1mil NP and and an item of their choosing. Soon TNT decided that battling should be rewarded with items, and brought out the Faeries as Battledome competitors, both to give out prizes, and to let people earn a spot in a series of League Championships they would be doing. 2001 was a very big year for the Battledome indeed, as an adventure with Brucey B exploded into an all out brawl in the Siege on Sakhmet. This plot saw Sloths' hoards smashing down into Sakhmet in the Lost Desert, and introduced the first plot-exclusive prizes in the form of scarabs, which were released soon after the plot ended. This period also saw many of the old 1P challengers, such as the Faeries, disappearing. Soon the familiar challengers we know and love would begin making their way into Neopia. August was a very special month in particular to me as it was the month in which I joined Neopets... But no one cares about that. In August there were many new important Battledome developments, Punchbag Bob, the weapon testing dummy, was introduced into the dome - and with him came the 1P Highscore tables for each competitor. This was also the month during which Maraqua, the world which introduced the Battledome, was destroyed by pirates. After Maraqua's destruction, October saw the introduction of the Hidden Cove and Krawk Island. The Smuggler's Cove would soon become home to some of the strongest and rarest of all items on Neopets, with small, set numbers of each item being released, making each item instantly expensive. Getting even one of these items was an impressive feat. Until 2002, not much new came to the Battledome. A steady stream of new competitors and weapons, however, was indication that it was not forgotten. March of 2002 came in with a disturbing new Hidden Tower item called the "Eraser of the Dark Faerie", which allowed users to randomly destroy an item permanently. Hidden Cove owners, beware! After months of buildup and plot during the year, November finally marked the commencement of Neopia's first two-sided war. The Invasion of Meridell plot saw players choose a side between Darigan and Meridell to help decide the outcome of the plot. This was not only the first time players could choose a side, but also an important marker in user participation. In December, after a very close battle in which the sides were constantly swapping as to who was winning, Darigan reigned supreme, and parts of Meridell were destroyed. Some areas of Meridell would no longer work, and players were able to see what happened when evil wins (although Meridell's ethics weren't much better). Prizes for the war were given out, and a finale was promised, to arrive at a later date. Ringing in the new year with promises of a conclusion, TNT released a pivotal item into the Battledome sphere with the Sword of Skardsen. This sword was a very solid attacker that would become the staple of battling, especially 1P battling, for years to come. In April of 2003, the Invasion of Meridell was finally brought to its conclusion with both sides of the conflict joining together to try and take down the now insane Lord Darigan. Due to winning the first part of the war, this final boss was out to destroy Neopia until he was slain by featheralley, who laid the killing blow and saved Neopia. With this great victory the Battledome lay dormant for the rest of the year, before exploding into life in 2004. In early 2004 a new TCG set was released ,which revealed the next plot to be the Invasion of Lord Kass and the Battle of Meridell. It also saw the release of the humble Kacheek Flour, which would one day become a very important part of the Battledome and guilds. February marked the start of Kass's invasion, and once more users were fighting to the tooth in Meridell, in an epic struggle that could redefine Neopia. Red Codestones also made their appearance during this war, offering a new way to train higher level pets. After months of fighting, Kass finally lay defeated in May 2004. The fight was close, but this time the Meridell Supporters had the upper hand, and lay waste to Kass. The Jelly Kacheek always beats Kass! This month also saw the release of the famous cove Super Attack Pea, which not only filled the place of the single strongest multi-use battle item, but also became the bane of many Battledome chatters (and Neopians in general) due to the release of an avatar related to it. 2004 was a very active year for the Battledome, with a second war taking place in October. The Hannah and the Ice Caves plot saw Hannah's forces facing off against the Thieves Guild with users picking their side. This ended two months later, with the sheer number of Hannah's forces (average of 35 points per player) overwhelming the otherwise more skilled thieves guild players (average of 60 points per player). Battledoming was pushed to the next level with the affordable 2005 release, the Scarab Ring. This ring offered a powerful dual duty attack and defense, which set the standard for battling due to its cheap price. This next year also saw the return, finally, of Maraqua as the 2005 Curse of Maraqua Plot began. Once more there was a two sided war, the last one in the Classic Battledome. This plot introduced many new ideas which changed the way war plots would have worked, such as the ability to play as a supporter rather then an active fighter, and league based Battledome difficulty. This plot heralded in a new era of Neopets with the introduction of the Prize Shop. Curse of Maraqua actually had FOUR separate prize shops, two for each side. These shops, while offering similar items, offered one set for supporters and one for battlers. Although this sort of Prize Shop was not seen again, it set a standard for the most beloved future plots. In August 2005 TNT brought out a second plot, the popular Lost Desert Plot. Unlike previous plots, this plot was a puzzle plot and had no two sided combat of any kind. The only battling used in it was done so as a story point, and not as a dedicated battle. This plot ended in November, and was seen as a good plot due to its mix of puzzle, story, and battle elements. A year later, in 2006, another plot was released in October called the Tale of Woe plot. Despite being shorter, the Tale of Woe contained much more combat then before and mixed it in well with the story elements. The Tale of Woe started many conventions for battling in plots, and allowed it to be used very effectively in the calculation of points. The Tale of Woe plot also made the idea of a group boss popular, and thousands of losses were required to chip down on the boss Mayor. Rather annoyingly for dedicated battlers, this plot also introduced the concept of win limits, brought about to limit the number of plot points users could get from battling. Annoyingly, win limits were not publicly announced till after the plot ended which led to many people feeling unsatisfied with their reward. During April 2007, the Battledome closed temporarily due to an April Fools Day joke. Due to the slow decrease in Battledome news, users were shocked by this prank, which led people to believe it was truly being canceled due to age concerns. In May, users thankfully received another plot with a battling component. The Lost Isle plot, however, was a disappointment to Battledomers, as it was cut short by the Altador Cup and given an incredibly abrupt ending right as Battling seemed most promising. This plot was also plagued with Battledome glitches. After being talked about years before, and unceremoniously being put on the back-burner, in 2008 the Return of Doctor Sloth plot busted onto the scene in a blaze of gunfire. Despite being relatively short, this plot contained plenty of battling and the prize shop revolutionized future combat in the dome. With the release of the Ylanas Blaster the Battledome finally had an affordable multi-use weapon which was just as powerful as the Neoquest 2 insane difficulty items. This prize set the bar for future plots, which all seemed to give out similarly powerful weapons over the next few years, raising the bar dramatically. 2009 was the beginning of the end for some, with the release of the Atlas of the Ancients plot. Despite looking promising at times with large monsters appearing every few comics, this plot contained no battling, prize shop, or anything that people looked for in a plot. Battledomers started to worry if they would never see another good plot again, as Neopians started to dislike the plot in droves. This plot served as a wakeup call for users and resulted in a flurry of Neoboard complaints. More troubling to users was the fact that despite being an underground world full of monsters, the world Moltara did not even have a weapon shop, leading more Battledomers to lose heart. April Fools Day 2010 caused even more disappointment for Battledomers with the prank of the 3D Battledome, but at least did show that TNT hadn't forgotten it. This fact became abundantly clear in September, as the Faeries' Ruin plot began offering battlers the perfect opportunity to stretch their muscles. Besides being a good plot story wise, battlers were also treated with win-limits that actually revealed themselves as they were reached and a huge number of opponents. TNT repeated opponents to increase the ability for newer battlers to play, while still introducing some significantly powerful challengers and plenty for battlers to sink their teeth into. Upon conclusion, most players saw this plot as the best in recent memory, and this gave battlers a lot of hope for the future. The prize shop even introduced the soon-to-be-staple strength increaser in the form of the "Altador Strength Potion" which offered the best value for money strength increaser on Neopets. Despite the awesome that was the Faeries Ruin, 2011 was devoid of Battledome. No New Plots, No Competitors, No Hope? 2012 was not much better, as a single Battledome challenger in a site event broke Battledome Scores. TNT fixed the main scores, but pet scores are lost. What was worse was the fact that the Neggbreaker could be beaten an unlimited number of times using a plot item, despite having 10k hp. After this issue was resolved, TNT re-released the Neggbreaker without the game breaking score glitch or the ultimate power of the amulet to create the first truly expert Battledome opponent. Later in the year the Battledome completely closed its doors in what is the end of an era... To be met with the joyful news of a brand new Battledome! Despite being home to many memories and epic fights, the Classic Battledome was also home to many bugs, many of which were around for most of the Battledome's life. Problems included trying to join a fight only to be met with "Pet doesn't Exist" or "Invalid Fight ID", the lag caused by the immense server load during war plots, or even being unable to get pets out of combat during war plots. Despite these annoying bugs, the Battledome will always live on in our hearts. The most recent bug to be released was the Neggbreaker bug, which gave 100k Battledome points for winning an easy and unlimited repeatable fight. Later this glitch was partially fixed, but the score remains for individual pets who took part in the event. Let us also take a moment to look back at the old, rather patchwork icons which have since been replaced by more colourful versions. These icons once formed the cornerstone for the battledome, in order of appearance are Physical, Water, Air, Darkness, Earth, Fire, Light and Healing. Another change which came later with the new battledome was that of the Faerie Abilities. All the old abilities were removed and replaced with new ones. While most of these Abilities were useless some became a solid part of the battledome. you can still see the old Faerie Abilities listed Here. On the 17th of October 2012, the Classic Battledome was put to rest. With it's passing, let us now look back on its life with a smile and hope that the future will be bright. If you are one day reading this article when everyone else has forgotten, please you too take a moment to think back on all the important changes the Battledome brought to Neopia. Battledome, I am sure I am not the only one who will mourn your passing, it's been a hell of a ride. This page was last updated on September 26, 2014.